George T. Jefferson, emeritis Colorado Desert District Paleontologist and former director of the paleontology program at the district's Stout Research Center, managed paleontologic resources for southeastern California's state parks. Formerly Associate Curator for the Page Museum at the La Brea Tar Pits, he has degrees in geology and paleontology from University of California, Riverside, and has spent much of his career studying fossil vertebrates of the southwestern U.S.. George was the prime mover in publishing the national award winning project "Fossil Treasures of the Anza-Borrego Desert: The Last Seven Million Years." ​ When most people think of Anza-Borrego Desert State Park, they usually envision wild flowers, bighorn sheep, or vast arid landscapes framed by rugged mountains. Few realize that the expanses of Anza-Borrego's eroded badlands also provide a very different view, a window into the region's long vanished past. The Colorado Desert of southeastern California was not always a seemingly barren wilderness. The key to understanding and engaging this prehistoric world is paleontology, the study of the fossilized remains of ancient life, and Anza-Borrego has an exceptional fossil record. The fossil treasures from the park include preserved plants, a variety of invertebrate shells, animal tracks and an incredible array of bones and teeth. Most Anza-Borrego fossils date from 6 to less than a half million years old, about 60 million years after the last dinosaurs died. Anza-Borrego Desert lies in a unique geologic setting along the western margin of the Salton Trough. This major topographic depression, with elevations under 60 m (about 200 feet) below sea level, forms the northernmost end of an active rift valley and a geological continental plate boundary. The Trough extends north from the Sea of Cortez (Gulf of California) to San Gorgonio Pass, and from the eastern rim of the Peninsular Ranges east to the San Andreas Fault Zone. Over the past 7 million years, a relatively complete geologic record of over 6,150 m (20,000 feet) of fossil bearing sediment has been deposited within the Park along the rift valley's western margin. Here, paleontological remains are widespread and exceedingly diverse, and are found scattered over hundreds of square miles of eroded badlands terrain extending south from the Santa Rosa Mountains into northern Baja California, Mexico. ​Both marine and terrestrial environments are represented by this long and rich fossil record. Six million years ago the ancestral Gulf of California filled the Salton Trough, extending northward past what would become the city of Palm Springs . These tropical waters supported a profusion of both large and small marine organisms. Through time, the sea gave way as an immense volume of sediment eroded during the formation of the Grand Canyon spilled into the Salton Trough. Bit-by-bit, the ancestral Colorado River built a massive delta across the sea way. Fossil hard woods from the deltaic sands and associated coastal plain deposits suggest that the region received three times as much rainfall as today. Anza-Borrego gradually changed from a predominately marine environment in to a system of interrelated terrestrial habitats. North of the delta and intermittently fed by the Colorado River, a sequence of lakes and playa lakes has persisted for over 3 million years. At the sametime, sediments eroded from the growing Peninsular Ranges and Santa Rosa Mountains spread east into the Trough. It is these sediments that provide an almost unbroken terrestrial fossil record, ending only a half million years ago. Here, the deposits of ancient streams and rivers trapped the remains of wild life that inhabited a vast brushland savannah laced with riparian woodlands. This record of changing environments and habitats includes over 550 types of fossil plants and animals, ranging from preserved microscopic plant pollen and algal spores to baleen whale bones and mammoth skeletons. Many of the species are extinct and some are known only from fossil remains recovered from the Park. Combined with a long and complete sedimentary depositional sequence, these diverse fossil assemblages are an unparalleled paleontologic resource of international importance. 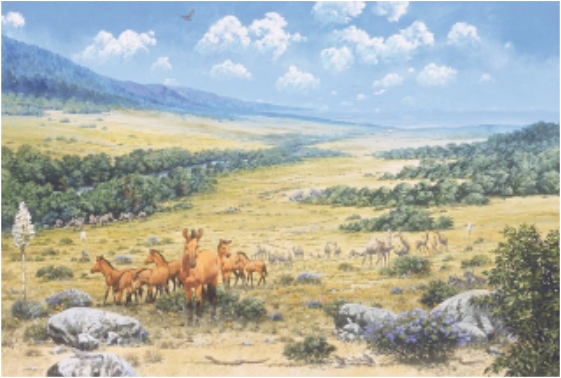 Both the Pliocene-Pleistocene Epoch boundary and the Blancan-Irvingtonian North American Land Mammal Age boundary fall within the long geological record from the Anza-Borrego Desert . Environmental changes associated with these geological time divisions are probably better tracked by fossils from Anza-Borrego than in any other North American continental strata. These changes herald the beginning of the Ice Ages, and the strata undoubtedly contain fossil clues to the origin and development of modern southwestern desert landscapes. 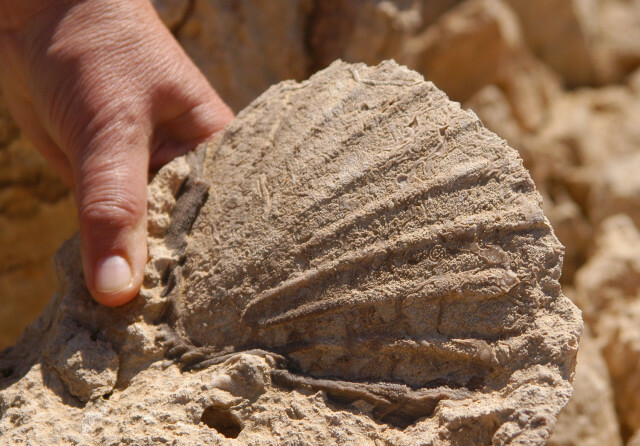 The first fossils, marine shells from the ancient Sea of Cortez and fresh water shells from prehistoric Lake Cahuilla , precursor of the Salton Sea , were collected and described by William Blake in 1853. Blake was the geologist and mineralogist for the U.S. Pacific Railroad Exploration commissioned by Congress and President Pierce to find a railway route to the Pacific. It was Blake who first named this region the Colorado Desert. Since the late 1800s, numerous scientific studies and published papers have centered on the marine organisms that inhabited the ancestral Sea of Cortez . Fossil assemblages from the classic Imperial Formation include calcareous nanoplankton and dinoflagellates, foraminifera, corals, polychaetes, clams, gastropods, urchins and sand dollars, and crabs and shrimp. 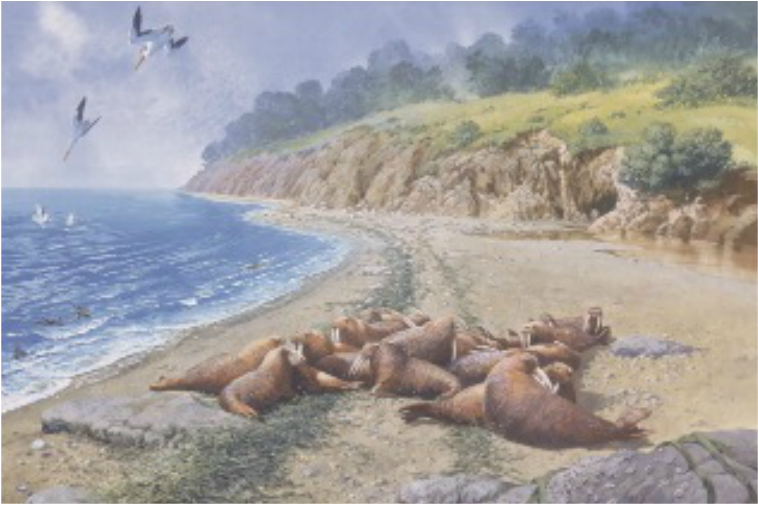 The deposits also yield the remains of marine vertebrates such as sharks and rays, bony fish, baleen whale, walrus, and dugong. Marine environments such as outer and inner shelf, platform reef, and near shore beach and lagoon are all represented within the Imperial Formation. As the sea shallowed, estuarine and brackish marine conditions prevailed, typified by thick channel deposits of oyster and pecten shell coquina that now form the Elephant Knees along Fish Creek. Many of the marine fossils are closely related to forms from the Caribbean Sea . They document a time before the isthmus of Panama formed, when the warm Gulf Stream of the western Atlantic invaded eastern Pacific Ocean waters. ​As North and South America connected about 3 million years ago, terrestrial faunal migrations on a continental scale, the Great American Biotic Interchange, are evidenced by Anza-Borrego's fossils. Animals like giant ground sloths and porcupines made their first appearance in North America at this time. The oldest terrestrial vertebrate fossils from the Colorado Desert predate the late Miocene invasion of the Sea of Cortez . These very rare fossils, which include a gomphothere (elephant-like mammal), rodent, felid and small camelid, and were collected from 10-12 million year old riverine and near shore lake deposits. However, the most significant and abundant vertebrate fossils have been recovered from the latest Miocene through late-Pleistocene riverine and flood plane deposits of the Palm Spring Formation in the Vallecito and Fish Creek Badlands and Ocotillo Conglomerate exposed in the Borrego Badlands. These fossil assemblages occur in a 3.5 million year long uninterrupted stratigraphic sequence that has been dated using horizons of volcanic ash and paleomagnetic methods. The bestiary for this savannah landscape reads like awho's-who for some of the most unique creatures to inhabit North America, animals like: Geochelone, giant bathtub-sized tortoise; Aiolornis incredibilis, largest flying bird of the northern hemisphere, with 17 foot wing span;Paramylodon, Megalonyx and Nothrotheriops, giant ground sloths, some with bony armor within their skin;Pewelagus, a very small rabbit (paleontologists do have a sense of humor); Borophagus, hyena-like dog; Acrtodus, giant short-faced bear; Smilodon, sabertoothed cat;Miracinonyx, the North American cheetah; Mammuthus imperator, largest known mammoth; Tapirus, extinct tapir; Gigantocamelus giant camel; and Capromeryx, the dwarf pronghorn. 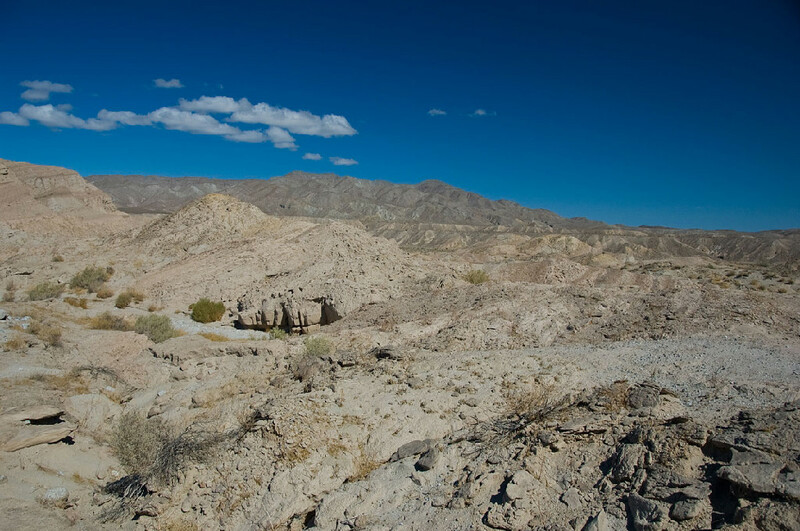 Although paleontological exploration of Anza-Borrego Desert State Park has stepped firmly into the twenty-first century with the application of GIS and computer assisted analyses to field surveys and resource management, many questions still remain. Expanding the detail and clarity of our paleontological view of the region's vanished past and improving our understanding of it's significance is an on going challenge. Exploration, conservation, research and interpretation continue as new fossils are discovered.